This is one of those self-indulgent posts that those coming here for commentary on politics may not find interesting. Consider yourself warned (wink). In 1975, I couldn’t wait to escape Fort Benton. I was an angst-filled 18-year old when I went off to Gordon College near Wenham, Massachussetts, leaving my childhood life in Montana behind. I seemed designed for the big city, and found one: Chicago, which really is my kind of town. But time does change things. This summer I returned to Fort Benton to celebrate my dear parents’ sixtieth wedding anniversary. And in the midst of that fun, reaquainted myself with the little town I left behind. It is a gem of a place, dressed up for tourists (which frankly keep its economy ticking) and surrounded by natural beauty that lend to the charming effect. Lewis and Clark’s famous expedition west passed by and camped near the future Fort Benton (Montana’s State Memorial to Lewis and Clark, above, is located on the levy where I as a child fished). 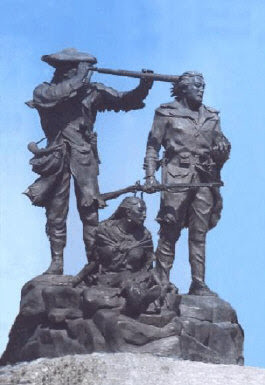 The memorial captures the two men and their Native American guide, Sacagawea (who carries her baby with her). The expedition spent nine days near the future Fort Benton figuring out which was the way to the Pacific Ocean. Founded in 1846 as an American Fur Company outpost called Fort Lewis, it went through another name change before being renamed after Senator Thomas Hart Benton of Missouri. And perhaps this was because it was St. Louis, Missouri that made the saying about successful businesses, “It’s location, location, location” come true for Fort Benton. The Fort itself had begun disintegrating, but the town around it began to grow. Fort Benton’s historical significance exists for mainly one reason. Steamboats could navigate no further than Fort Benton from their starting point in Saint Louis, making Fort Benton “the world’s innermost port” and also the “overland trail” distribution point for supplies over the entire northwest territory. The 1880s could be called the town’s golden era. This lasted, alas, only until the railroads came through, and overnight Fort Benton was reduced from being one of the wild west’s most well-known and colorful towns to being an historical footnote. That wasn’t until after, however, at least one Montana Governor (Meagher) either was pushed or jumped overboard from a steamboat offshore and was never seen again. For more on Fort Benton history, I suggest the town’s homepage and also Ken Robison’s blog (he touches on Meagher-related issues and also a very-little known aspect of African Americans in Fort Benton). During my childhood Fort Benton was a town touched by that historical magic. My older brothers would go down to the remains of the old fort’s adobe walls (today which are almost gone, except for one small portion preserved). They’d hunt for lead ball bullets, arrowheads, and the like, and it was rumored by them that they’d found some. The town’s Cottonwood trees (they seem to be everywhere) would sometimes fill the gutters with piles of “cotton” which we firestarters would light with matches and delightedly observe the almost gunpowder-quick result down the entire length of the gutter. This summer, Fort Benton was at its most charming. The town has systematically finished what in my day had barely begun; its transformation from a quiet agriculturally-based economy to a self-concious tourist-attraction. Whereas in most cases, such a thing injects artificiality (the smell of plastic) into its subject, Fort Benton looks all the better and seems all the more interesting. On one level, I fear those involved in making Fort Benton a touristed place face a serious problem. It is just far enough from interstate highways (approx. 40 miles) to make the journey daunting for hurrying families. But if the trip is undertaken, the town rewards those who come. My own favorite “new” attraction is the path for walkers, runners, and bikers running along the entire riverfront. I only got to run it once, but ran the entire thing round trip, making for a good three mile plus workout. Fort Benton planners look to lengthen this path, and I most strongly encourage that resolve. I’m mad for my Chicago bike and running path, but to find a miniature version of same in Fort Benton so well conceptualized and carried out is distinctly satisfying. Various new businesses include a fabulous ice cream emporium, The Culbertson House, a quite “big city” alternative book store (which the name of escapes me and seems to have no web presence), and the most excellent Wake Cup coffee shop and deli. Their location, directly across the street from the afore-mentioned Lewis and Clark statue, makes them simple to find. Other great things to do in and around Fort Benton include traveling the Missouri River by canoe or even (for shorter one half day trips, inner tube). We’ve done the short trips; the longer ones reveal one of the longest pieces of “wild river” left in this country, with stunning rock formations and many camping spots throughout. I hope for those visiting Montana that Fort Benton may figure into your plans. And for me, it feels this little plug is a sort of pay-back to a place that gave me a lot, that saw some of my darker moments but also saw the beginnings of my faith journey I still travel on. Going back to the path along the Missouri, I suppose it is a symbol of what Fort Benton itself was for me, a part of my way, and in retrospect a part more meaningful and memorable than I once thought it could be. Perhaps one day I’ll talk about Brother Van, the circuit-riding Methodist preacher who lived in Fort Benton during the town’s heyday. For now, I’ll end with one of his favorite and most-sung hymns, a strangely sad / joyful favorite of my father’s and perhaps the entire Trott clan, and one which we sang in Fort Benton’s Methodist Church even this summer. While toiling sad-hearted in the sunshine and rain.